Panama City Florida is whatever you want it to be. Looking for a fabulous white sandy and quiet beach to relax on? Come to the west end. Want an active, something fun to do all day, attractions, restaurants galore, movies, great night life? Go to the east end. Or, better yet, why not rent a car and have both worlds? Being an, ahem, older person, I like to stay at the quiet end. Then, when I have recovered from whatever the world has done to me since I was here last, I am ready to migrate toward the more active area for some fun. Come for spring break if ... you are college-age or you still think being with thousands of college kids is a good thing. MTV films the action here during Spring Break so if you are a college student, try to get on TV so your parents will know where you are. This way they can start preparing to replenish the tuition money sent earlier that you will report disappeared over the last two weeks (while you were in library studying, of course). To avoid spring breakers, avoid February and March since different schools break at different times. Some hotels don't allow college students during spring break so ask the hotel about their 'spring break' policies. High season in Panama City Florida is summer, (typically May through August) where everything is open and ready for action. During high season, restaurants are fully staffed for diners at all times and the attractions have been oiled, greased, repaired, repainted and are ready for your bucks. Not so the rest of the year when Panama City Beach goes into a sort of hibernation. However, late spring and early fall is a glorious time to be here and weather-wise, it is perfect. Panama City Florida is subtropical so it can be nicely warm (most of the year) or uncomfortably cold (in the dead of winter). If you come in winter, bring a jacket and umbrella and always a wrap for night. I personally like to visit Panama City Florida during the fall months because the weather is 70’s to 80’s, the tourists are few and the rental prices have dropped considerably. The downfall is that many restaurants have gone into hibernation until next summer. During high season, eat early or wait for a table, and wait, and wait, and wait. Most don't take reservations but ask and if so, rejoice and try to reserve a couple days ahead. Otherwise, eat early; get seated before 4:30. Don't forget dessert. Food is plentiful and portions are huge so bring dessert home and enjoy it after a long stroll on the beach as the sun goes down. We figure a long walk offsets the calories. Think Key Lime pie, Florida's favorite dessert. If all of the exciting events and activities taking place on the beach are not your style, you can enjoy some of the softest, whitest sand for relaxation or swim in some beautiful clear blue-green water. 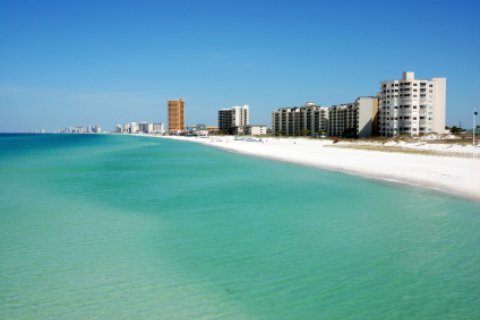 No matter what your favorite beach activity is, you are sure to find it at Panama City Florida! One of the most popular attractions, awarding winning beauty, remains untouched and undeveloped and puts many wildlife attractions on display. Look for different species of wildlife and enjoy natural sand dunes. Be entranced by the gorgeous untouched beaches or explore some of the many nature trails. Visit Shell Island, by boat or ferry and experience an unforgettable, shelling experience. Take a ride in a glass bottom boat to explore underwater life and be fascinated by the energy going on beneath the surface. Spend the day shopping to your heart’s content at Pier Park, a huge outdoor shopping mall that has regular retailers and specialty shops. Try the many great restaurants, including Margaritaville and visit the 16-screen movie theater. Want to feel like you are on the set of a movie? Go to Coyote Ugly Saloon where the live entertainment comes from the bartenders. Kids of most ages: There are several amusement parks to choose from in Panama City beach. Ride one of “the world’s most exciting roller coasters” at Miracle Strip Amusement Park or Shipwreck Island Water Park. Eating: Enjoy a delicious steak dinner at Angelo’s Steak Pit or if you have a little more to spend and are looking for delicious steak and seafood choices, check out Firefly. Recommended is award winning restaurant, Capt. Anderson’s. Trust the advice of your waiter as to fish and method of prep. As a rule, you can expect the fish you will eat tonight, was yanked out of the Gulf earlier today. Sleeping: There are many condominium complexes that rent rooms by the night or week located right on the beach. If you prefer a hotel (and a bit more affordable) stay, try Hampton Inn for moderately priced and comfortable rooms with friendly and adequate service. Located only one mile from the beach, this is a great central location. For another affordable choice right on the beach, try Palmetto Inn & Suites, which offers spacious and comfortable rooms with remarkable beach views.